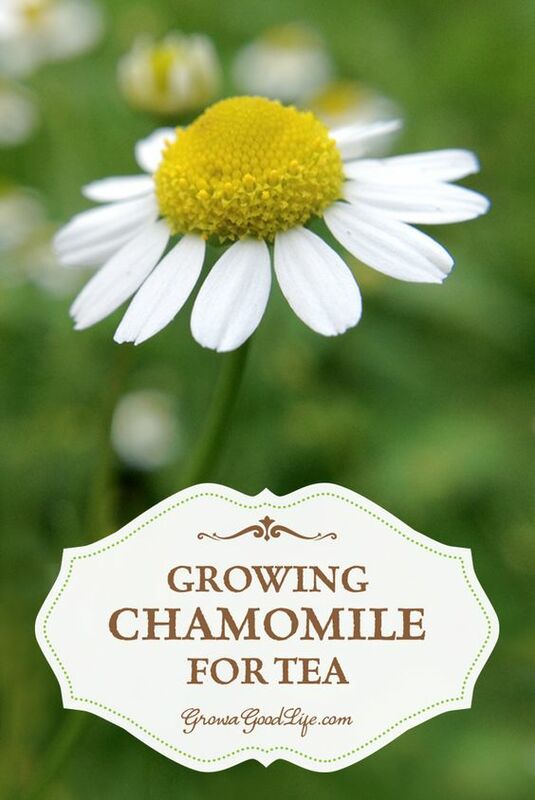 Growing chamomile for tea is easier than you think. Once the plants are established, it is drought tolerant and trouble free. There is something so comforting to taking a break during the busy day and enjoying a cup of chamomile tea. I like to add a drop of local honey to sweeten it just a bit. Then I take a deep lingering breath over the cup as the tea steeps and cools down enough to drink. Chamomile is a member of the daisy family (Asteraceae) and is best known for its soothing and calming properties and its fruity, apple-like flavor. 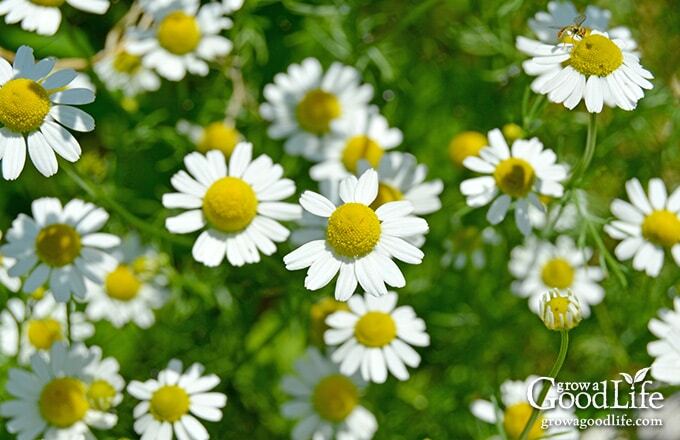 Chamomile is documented through Egyptian, Roman, and Greek history as one of the most ancient medicinal herbs. Chamomile’s reputation as a remedy for relieving anxiety was confirmed in a 2009 study (Source). Today, chamomile is commonly used for many ailments including hay fever, menstrual disorders, inflammation, insomnia, muscle spasms, gastrointestinal disorders, and rheumatic pain. It can be applied to the skin for inflammations and skin diseases. Two most popular types of chamomile are German Chamomile (Matricaria recutita), an annual that can grow up to 2-feet high; and Roman Chamomile (Chamaemelum nobile), a perennial that grows 12-inches high. Both contain essential oils and anti-oxidants that are calming and relaxing. 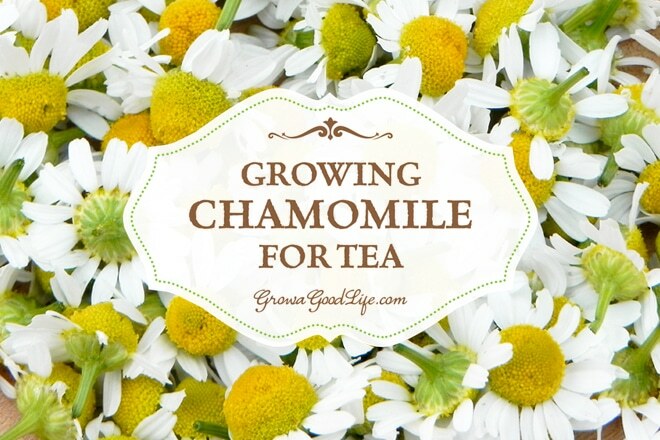 Once I learned how easy it is to grow chamomile from seed, I have been growing chamomile for tea ever since. German chamomile grows best in a sunny location in the garden but can tolerate some shade. It can grow in containers but may become top heavy, so larger containers are recommended. 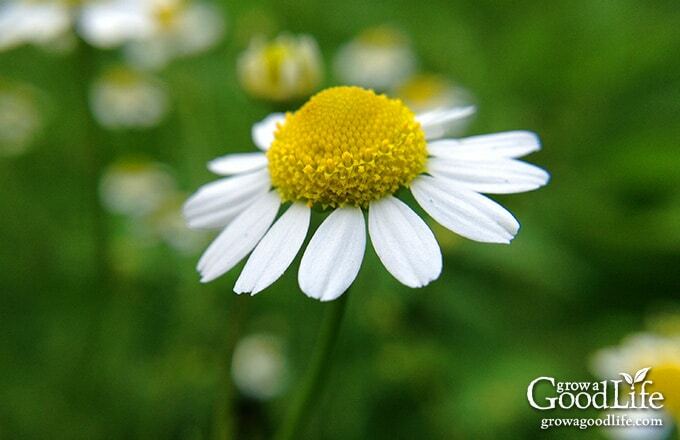 Once established, chamomile is pretty drought tolerant and trouble free. It isn’t a heavy feeder so will not need additional fertilizer through the growing season unless your soil is poor. Start German chamomile from seed indoors about 6 weeks before your last expected frost date. Sow seeds by scattering a small pinch of the tiny seeds on the soil surface, mist with water, and tamp lightly. Chamomile seeds need light to germinate, so do not cover the seed with soil before misting with a spray bottle to water. Germination usually occurs within two weeks. Once the seedlings reach 4-inches high, select the strongest and healthiest plants and thin by snipping the others at the soil surface. Harden off your chamomile seedlings and transplant to the garden after danger of frost is past along with other heat loving plants. Space the plants about 8-10 inches apart and water frequently until they are established and produce new growth. Usually within several weeks after transplanting, the first stems will begin reaching for the sky and the flowers begin to form and bloom. Flower heads are ready to gather when the petals are flat or begin to fall back from the center. Gather the flowers on a sunny day after the morning dew has dried. Harvest blossoms by snipping them off when they are fully open. Air-dry chamomile by layering the blossoms on a plate, and allow to dry naturally in an upper cabinet away from dust and sunlight. You can also spread the chamomile out on a window screen or drying screen to dry. Depending on the humidity, this usually takes 1-2 weeks. See how to make your own drying screen or check out these Stacking Herb Drying Racks. Alternatively, you can use a food dehydrator to dry chamomile quickly. Lay the flower blossoms out on the drying screens and run at the lowest setting until dry. You can tell when chamomile is dry, by crushing a blossom or two. It should crumble easily. See How to Harvest and Dry Herbs for Storage for more information on drying herbs. 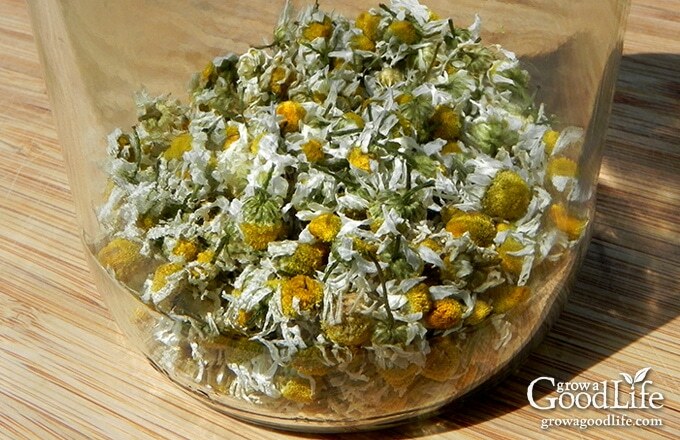 Once the chamomile is dry, store whole flower buds in a glass jar away from direct sunlight. To make tea, use about a teaspoon of dried chamomile flowers per cup. Place the chamomile blossoms in a tea infuser, pour boiling water over the chamomile flowers, and then steep for 5 minutes. When it is hot outside, I add ice cubes after steeping for a fresh flavored iced tea. Freshly harvested chamomile can be used for tea as well, but you will need twice as much. Drying concentrates the oil and flavor. I enjoy a cup of chamomile mid-afternoon especially when things are busily humming along. It gives me a moment to sip, gather my thoughts, and plan my next move. Klenner, Amanda. “How to use Chamomile to Reduce Stress.” Herbal Academy of New England. Foster, Steven. 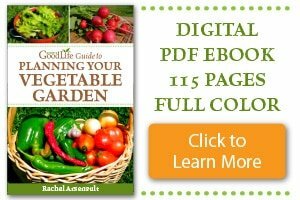 “How to Grow, Use and Identify the Chamomile Herb.” Mother Earth Living. Singh, Ompal, Khanam, Zakia. et al. “Chamomile (Matricaria chamomilla L.): An overview.” The National Center for Biotechnology Information. Amsterdam, Jay, Li, Yimei, Soeller, Irene, et al. “A Randomized, Double-Blind, Placebo-Controlled Trial of Oral Matricaria Recutita (Chamomile) Extract Therapy of Generalized Anxiety Disorder.” Journal of Clinical Psychopharmacology. Wolters Kluwer Health. Disclosure: Any medical information is for informational purposes only. Always do your research and exercise caution when using any herbs or plants as medicine. Chamomile is not recommended for women who are breastfeeding or pregnant, and can cause allergic reactions in people with hay fever and some types of flower allergies. This article was originally published on August 6, 2014. It has been updated with additional information, photos, and video. Previous Post: « Purslane: Weed it or Eat it? I bought some seeds years ago and every year they volunteer all over my garden in between my neat rows of vegetables. They always make me smile. Have you tried the Roman Chamomile for teas? I prefer perennials when I have the option, but if the flavor/quality of the German Chamomile is markedly better then I would want to go with that! Love the photos! Such pretty little plants. I started my chamomile indoors over a month ago. It germinated fine but has not grown any larger since a few days after germination. Do I need to thin it to only one little plant? What could I be doing wrong? I am starting it in seed pods in a tray. Meagan, It’s hard to know what is going on with your chamomile seedlings. I suspect the “seed pods” don’t have any nutrients to feed your chamomile plants. Chamomile isn’t a heavy feeder, but it does need some nutrients to grow. 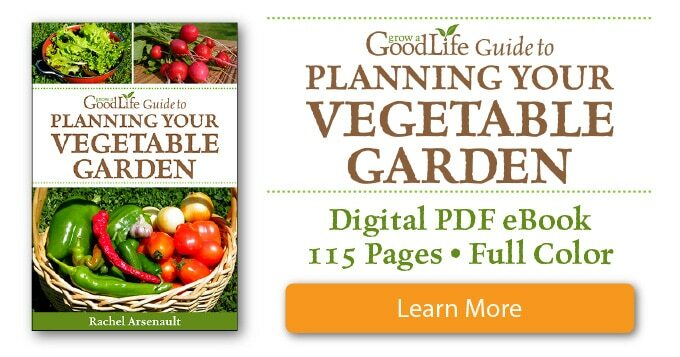 You could try watering with liquid fish emulsion to give your plants a boost. Thank you so much, I’ll try to move it to a different pot and see how it goes. This is my 1st time growing chamomile and i plant it with NFT hydroponic system, outdoor. I live in Indonesia(tropics country), 43days, 8-10cm, but i notice they are growing to down side to earth not up to sky, looks like a carrot leaf. It’s normal? Sumitro, Yes, it is normal for the foliage to look thin and feathery. The chamomile flower stalks will grow in the middle of the foliage and the flower will open up towards the sky. Lovely post on this beautiful plant! Thank you for the information. I wonder how this would do to grow as a house plant over the winter. Have you ever tried that? Jane, No, I haven’t tried growing chamomile as a houseplant. If you experiment with this, let me know how it does. Somewhere in the past I must have bought some camomile seeds, but now they just pop up in some of the numerous containers I grow things in. I don’t have to think much about it, they self seed so well. My question is about harvesting the flowers…can I still use flowers that have dropped their pedals and where the seed pod has turned tan in color. Where are the oils concentrated in this flower? John, The ideal time to harvest chamomile is when the petals are flat or begin to fall back from the center. Once the petals have dropped, the flavor begins to diminish and may even turn bitter. Best to allow these to go to seed to grow another crop. That may explain why the chamomile tea I just made was so awful tasting. Probably half of the flower heads had browning leaves or no leaves. I’m not sure what you mean by “begin to fall back from the center”…do you mean drooping at an angle more than the flat (horizontal) ones? John, Yes, it sounds like your chamomile was too far gone. When flowers open, they do so from the center and stretch their petals back towards the stems. As long as the flowers are open with the petals intact, the flavor will be there. Once the petals fall, the chamomile is forming seeds and the flavor will be bitter. I have not had any luck growing chamomile I’ve tried numerous times to no avail. Last year I started them early, inside under grow lights with new soil. They did well … I hardened them off and put them outside. They lasted about a week or two and just dried up even though I kept them watered. I LOVE chamomile, I just wish I could grow it. Georgia, Usually, chamomile isn’t difficult to grow. I wonder if watering less would make a difference. Or you could try growing it in pot or container. I’ve had that happen to me too. I was reading in Taylor’s Guide to Herbs and it says that Roman chamomile can not tolerate heat, so perhaps you had Roman chamomile plants. Maybe German chamomile will do better. Thank you for the post! I don’t have a light system; so I started seeds outdoors around mid-October and they are about 1cm high and are looking fine, so far. Last frost is about mid to late-February in my area and I’m worried I may have started them too early. Should I be worried about flavor and fragrance being off, or will they bloom alright? Should I take any precautions to ensure they stay healthy? Jenny, It sounds like you are off to a great start with your Chamomile plants. If you trim the blooms regularly, the plants will keep growing and blooming until frost. I grew chamomile this summer in a pot on my porch and although the plant grew I only got maybe 6 flowers it stayed green. Did I do something wrong. I watered it and kept in a sunny location. I was really looking forward to making tea. Hi Donna, It sounds like your pot may have been too small or maybe the soil didn’t have enough fertilizer for the plant to thrive. German Chamomile can spread out a foot or two. Try a larger pot and fresh potting mix next year. Great information! Thanks for sharing at Simple Lives Thursday. 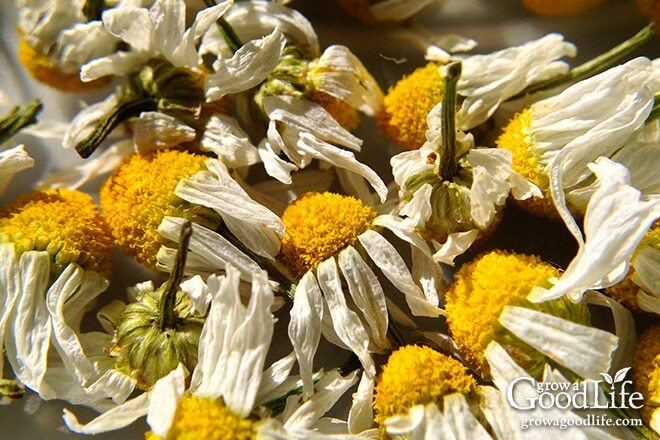 Madamdreamweaver, German Chamomile is an annual that will self sow if the flowers are not harvested or deadheaded. It does grow very well in pots. I suggest one Chamomile plant in a 15-18-inch pot. As I mentioned above, the plant can grow up to 24-inches and get a little top heavy, so be sure to use a heavy or larger pot. I’ve been considering growing German Camomile just because it’s pretty. Does it spread itself? (is it prone to taking over a location?) Does it do well in a pot garden? Chamomile does spread itself and will take over an area within the first 2 years after its first blooming. Chamomile will self sow if the blossoms go to seed. I allow some volunteer plants to grow in the garden, but they have never taken over. Great post! Chamomile is definitely on my list of future must haves. When it comes to store-bought tea, I generally stick to green tea. But if I could make myself a bit of tea from my own garden, that would be a treat. Margaret, I drink a lot of iced green tea too throughout the day, but when I want to relax or calm down, Chamomile is just the thing.